It takes a good amount of time and effort for an analytical chemist to develop a robust method to separate cannabinoids on an HPLC column as there are at least 104 different cannabinoids that have been isolated from the cannabis plant. Many of these cannabinoids are similar in structure and only differ in their cyclical structure, they are 21-carbon compounds, and are all derived from the parent compound CBGA. Most labs use one of two types of chromatography, liquid or gas, to analyze cannabinoids. High performance liquid chromatography (HPLC), which pumps samples along with solvent at high pressure through a packed column, is the primary methodology used in pharmaceutical, environmental, and forensics applications. HPLC is able to separate, identify, and quantitate components that are dissolved in a liquid matrix. Gas chromatography (GC), on the other hand can perform the same functions as an HPLC but with only those compounds that can be vaporized without decomposition. While an HPLC uses a liquid to move samples through the column, a GC uses gases such as helium or nitrogen as a carrier. The gaseous compounds interact with the walls of the column, which causes them to elute at different times, known as the retention time. In an HPLC, the liquid sample interacts with the packing material in the column and exits the column at different times also known as the retention time. In developing an HPLC method for cannabinoids, there are many considerations such as mobile phases, column type (pore, size, length), detector/wavelength selection. Given that the cannabinoids are so similar, it is easy to miss overlapping peaks and inaccurately quantify multiple cannabinoids under one peak. Here we present two examples: first, what can go wrong (Fig. 1) and second, what is ideal (Fig. 2). 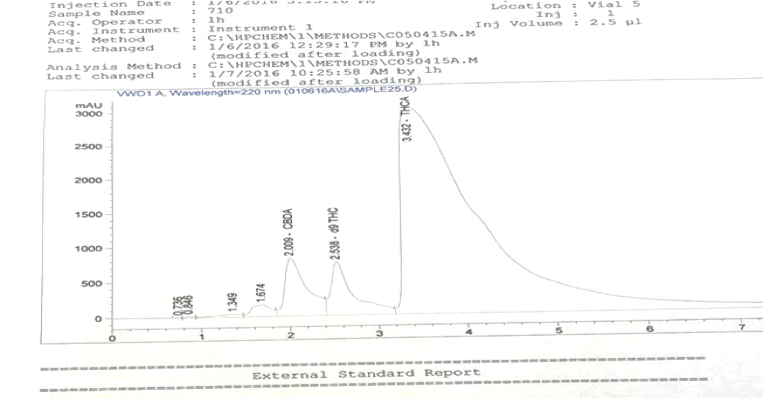 Figure 1 below is an actual chromatogram posted online by an independent cannabis-testing lab boasting of their high THC result. One can clearly see that the THCA peak tails badly and contains several other peaks, which have not been clearly resolved. The integration of this peak would lead to falsely inflated “THCA” results, which just leads to false advertisement and subsequent sales of a wrongly labeled product. In contrast, Figure 2 (courtesy of DigiPath Labs) shows well-separated peaks on a commendable chromatogram where each resolved peak can be accurately measured and quantified. Once again this specific topic on separation of cannabinoids typifies the challenges ahead in efforts to standardize cannabis testing. Falsely identified cannabinoid peaks used in calculating lab results have a detrimental effect on the cannabis industry. Labs and cultivators who support deceptive lab testing may gain in the short term with falsely high THCA content products; but lose in the long term as patients and consumers become skeptical of the industry’s ability to self-monitor. But for the grower who is genuinely interested in advancing the medical cannabis industry and empowering the patient with accurate information about their medicine, please ask to see your testing lab’s chromatograms, whether it be HPLC or GC to see the quality of the separation and integrity of each peak.